Meca Williams-Johnson, Ph.D. was the featured speaker at fall’s Southern Scholar Showcase. Meca Williams-Johnson, Ph.D., professor in the Department of Curriculum, Foundations and Reading, was the featured speaker at Georgia Southern University’s recent Southern Scholars Showcase. The showcase is a scholarship interview weekend for select students who achieve a score of 1360 on the redesigned SAT or 29 composite on the ACT and have a strong academic performance in high school courses. Students invited interview for valuable academic scholarships. Attendees also have the opportunity to learn about additional programs such as the University Honors and Southern Leaders Programs. Williams-Johnson has worked with the Honors Program from nine years, serving as a faculty mentor of the College of Education’s undergraduate honors students. An advocate for undergraduate research, she also encourages conference attendance and participation with her mentees. 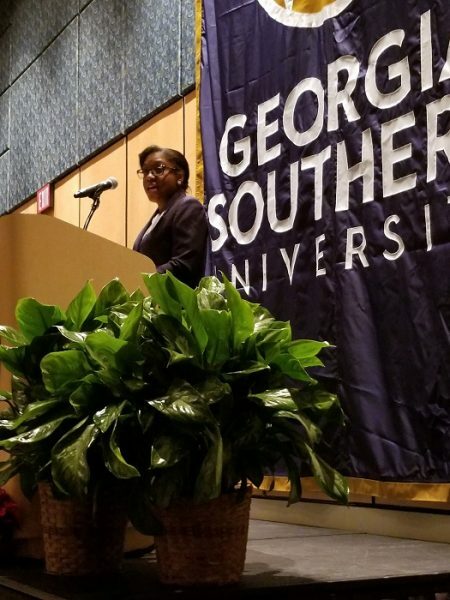 During her speech to incoming Georgia Southern students and their parents, Williams-Johnson expressed to the audience the caliber of education they could expect at the University. Williams-Johnson also explained that in working with honors students, she has experienced firsthand the “world class opportunities” students receive when participating in the program. The University Honors Program provides an enhanced educational environment for talented and motivated students who seek a challenging undergraduate experience. Students in the Honors Program engage in a variety of experiences including academic, development and service-learning opportunities. To complete the program, students must prepare an honors thesis or capstone project which has students actively participating in undergraduate research projects.